This is another nail art I wore last week that I wasn't able to post because of my busy schedule. I meant to submit this as an entry to a nail art challenge but I failed to submit it before the deadline simply because I forgot. The challenge was to create a nail design that is autumn inspired. 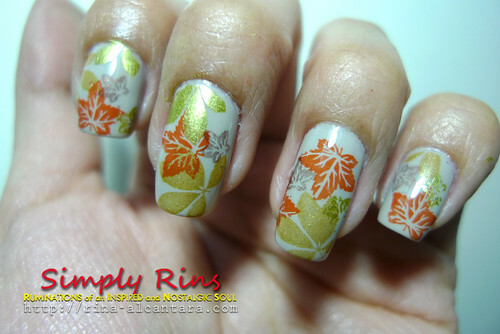 Fallen leaves for this autumn inspired nail art. This is 2 coats of Essie Playa Del Platinum. Application was quite tricky because streaks from the brush strokes were hard to eliminate. Applying top coat fixed it. 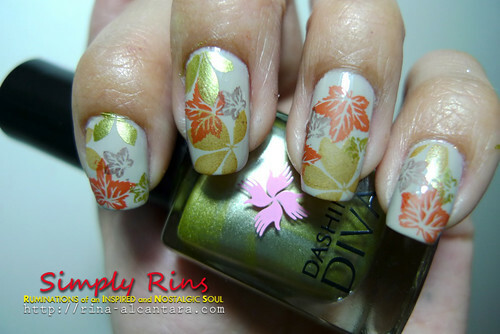 I wanted to play with colors with this nail art so I experimented a little with autumn colors. I first stamped leaves with an orange shade. I used OPI Chop-Sticking To My Story for stamping and it turned out quite opaque. I'm happy with the result. I found another polish good for stamping! Next, I added yellow shade leaves. I used OPI Bling Dynasty for stamping and again, it turned out quite opaque with the base color. I allowed the stamping to overlap to get a collage effect. Brown shade leaves was next in line. I used Dashing Diva East Village for stamping. It's not so opaque as I expected but it was enough for me to add a brown color to this nail art. Finally, I wanted something green. I used Dashing Diva Rosario Pistacio for stamping and opacity was good. Images from Bundle Monster BM04 and BM05 were used for stamping. If you'd like to join the weekly nail art challenge, please visit Fab Ur Nails or Art of Nail. You may also join the Fab Nailarts Facebook Page. Hopefully, I'll be able to submit my next entry for this week's challenge on time!